Below are a number of statements which help to provide insight and explanation into what Theosophy has to say on the subject of God. It will be seen that the term “God” is generally rejected in Theosophy – as is any notion of an anthropomorphic, personal, or semi-personal God – but that the Divine Itself is never denied but insistently and emphatically affirmed to be the One and Only Reality, the One Life everywhere and in everything, and the True Self of each and all. For those who may wish to further explore the philosophical basis which underlies the Theosophical teachings on these matters, the articles The “God” Question and The Impersonal Divine are both recommended to be read together. “This ONE SELF, absolute intelligence and existence, therefore non-intelligence and non-existence (to the finite and conditioned perception of man), is “impartite, beyond the range of speech and thought and is the substract of all” teaches Vedantasara in its introductory Stanza. “How, then, can the Infinite and the Boundless, the unconditioned and the absolute, be of any size? . . . To the (philosophically) trained Pantheist, the abstraction, or the noumenon, is the ever to be unknown Deity, the one eternal reality, formless, because homogeneous and impartite; boundless, because Omnipresent – as otherwise it would only be a contradiction in ideas not only in terms; . . .
“For to be one [i.e. a Theosophist], one need not necessarily recognize the existence of any special God or a deity. One need but worship the spirit of living nature, and try to identify oneself with it. To revere that Presence, the invisible Cause, which is yet ever manifesting itself in its incessant results; the intangible, omnipotent, and omnipresent Proteus: indivisible in its Essence, and eluding form, yet appearing under all and every form; who is here and there, and everywhere and nowhere; is ALL, and NOTHING; ubiquitous yet one; the Essence filling, binding, bounding, containing everything, contained in all. . . . Be what he may, once that a student abandons the old and trodden highway of routine, and enters upon the solitary path of independent thought – Godward – he is a Theosophist; an original thinker, a seeker after the eternal truth with “an inspiration of his own” to solve the universal problems. “Whether his will created or was mute. SOME RELATED ARTICLES: The “God” Question, The Impersonal Divine, Atman – The Higher Self, Understanding The Logos, The Three Logoi, Parabrahm, Brahman, and Brahma – Why The Confusion?, Theosophy – An Explanation and Overview, 12 Things Theosophy Teaches, Original Theosophy and Later Versions, Why does Theosophy deny the Miraculous and Supernatural?, Is Theosophy a Religion?, Theosophy Generally Stated, Who are you, Madame Blavatsky?, Praise for H.P. 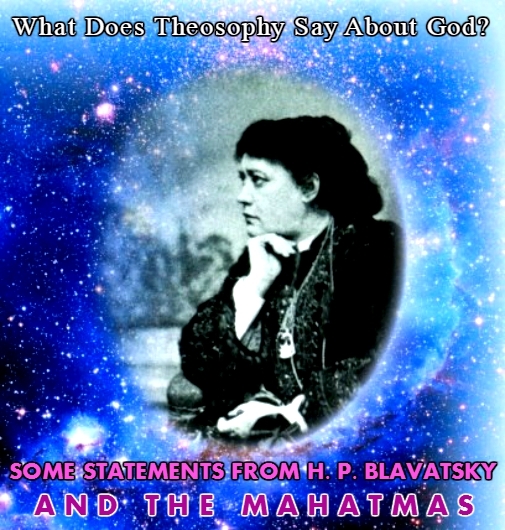 Blavatsky and Theosophy, Purucker Says The Absolute Was Once a Man, and Books on Theosophy.